I’m one of those people that don’t like wine and chocolate together. There’s something about all those diverse flavors going every which way in your mouth…all I want when I enjoy chocolate is to taste rich, dark, unadulterated chocolate without any distractions. I’ve been meaning to write more about chocolate, and when Clotilde announced she’s hosting Wine Blogging Wednesday 13, it was the perfect excuse to add some notes here about chocolate. I asked two friends and chocolate experts (I love having chocolatiers as friends)from two of my favorite chocolate companies how they felt about pairing chocolate with wine. You may not know this, but most chocolate is a blend of various roasted beans, plucked from pods and roasted to achieve a certain flavor and profile that the chocolate-maker is seeking. 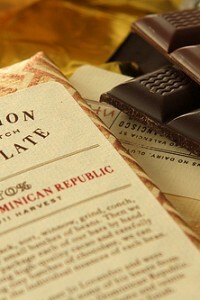 Like wine, chocolate is often blended from various beans, which of course can vary. Depending on variety, origin, fermentation, and roasting, cacao beans can have amazingly different flavors, so often they’re blended. And in spite of what you’ll read and hear, there’s often no advantage to single-origin chocolates over blended chocolates, unless it’s really important to you that your chocolate is only made from one particular kind of cocoa bean. 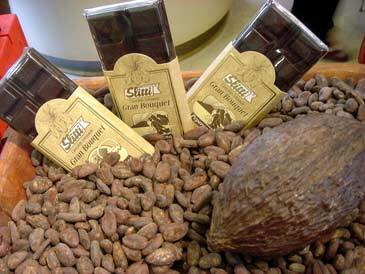 A few chocolate companies make excellent single-bean chocolate, such as Amadei, E. Guittard, and Domori; all are extraordinary and well worth eating, but I find other single-bean chocolates a result of good marketing and no more exceptional than some of the blended chocolates. As a former winemaker, chocolate-expert John Scharffenberger transitioned from sparkling winemaker to mastering the art of blending fine chocolate. During his explorations and tastings, he was intrigued by discovering similar flavor components in wine and chocolate, finding nuances that both had in common. The problem arises when those tannins compete with each other. That’s why I prefer a sweet, smooth, rounded ruby port wine with chocolate, rather than a bracingly intense wine, like Cabernet or Zinfandel. Often the two just obliterate each other and cancel out each others fine qualities. So I admit that for this chocolate and wine pairing, I fudged a but. I opted to pair chocolate with something unusual: Spiritueux de Cacao, a clear, distilled liquor made by steeping and heating cocoa beans then capturing the essence by collecting the aroma and bottling the liquid created by the steam. That’s why good eau-de-vie is rather pricey. Jörg Rupf of St. Georges told me he uses 60 pounds of Bartlett pears to make just one bottle of Pear William (pear eau-de-vie). Naturally I chose the chocolate one, and left the garlic one behind! Frederick Schilling, the ‘alchemist’ of Dagoba, one of my favorite organic chocolates (his Dagoba Xocolatl bar with chilis, cacao nibs, maca, and a hint of nutmeg is simply amazing), finds that the nuances of some of his exotically-flavored chocolates pair well with wine. Frederick loves pairing his floral lavender chocolate with a pinot noir and his delicious lime-scented milk chocolate with a crisp pinot gris. 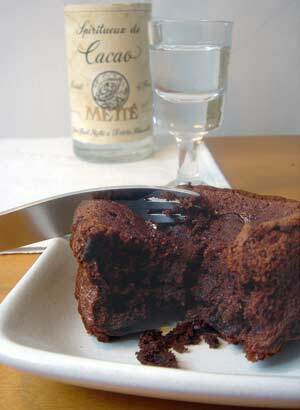 So here’s my ‘wine’ and chocolate pairing for Wine Blogging Wednesday 13: little rich, individual chocolate cakes. I make one for each person because I don’t like to share my chocolate! 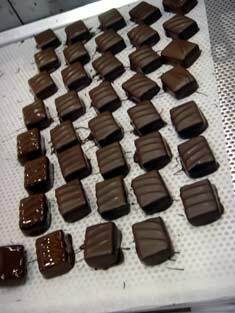 Each is studded with liquor-soaked prunes, adding soft, sweet little bites that meld perfectly with intense dark chocolate. 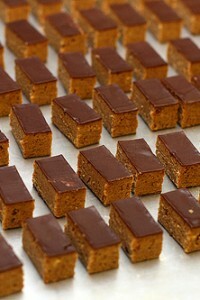 These petits gâteaux can be made in advance and the flavor improves as they sit. (Trust me, I ate all four cakes over the course of the day I made them. They kept getting better and better and better). If you don’t happen to have a bottle of chocolate eau-de-vie in your liquor cabinet, either come to Paris and pick one up (sorry, I don’t deliver)…or macerate the prunes in port wine or dark rum. In a small bowl, mix the prunes in the eau-de-vie. Cover, and let macerate for a few hours. 1. Preheat the oven to 375° F degrees (190° C). 2. In a medium bowl set over simmering water, melt together the chocolate and cream. Remove from heat. Mix in the prunes and any liquor in the bowl remaining, then let cool to room temperature. 3. In the bowl of a standing electric mixer, at high speed, beat the eggs and sugar with a pinch of salt until thick, about 5 minutes. 4. Fold one-third of the beaten egg mixture into the chocolate, then fold in the remaining egg foam. 5. Divide batter between each cake mold. Bake for 30 minutes, until cakes are tender and still soft when you touch the top. Each will rise, then gently sigh down a bit. Remove from oven and cool a few minutes before removing the paper cake mold (use a scissors to cut it away). Serve warm or at room temperature with very cold cr&egraveme anglaise and perhaps a scattering of crisp-toasted sliced almonds. Note: If you can’t get paper cake cups, you can use paper muffin liners in a muffin tin. Ok, how’s that for a nice, rich little chocolate dessert? I’m so wiped out from all that chocolate, I need a break. Let’s see, where should I go this weekend? Hi David, the cake looks gorgeous! 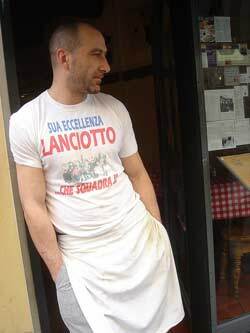 And I will definitely have to make my way to Lavinia.. I keep seeing Eau de vie around and its hard to resist something with a name like that. Italy sounds like a good idea. Liquor and chocolate cake sound almost as good. Your recipe looks divine! Can’t wait to try it. Wow…I don’t like wine with chocolate either, merci for helping me not feel so alone. Food trends are like hairstyles…even the “shag” was once considered cool! Or the mullet?? Ruby port and chocolate—yummmmm. 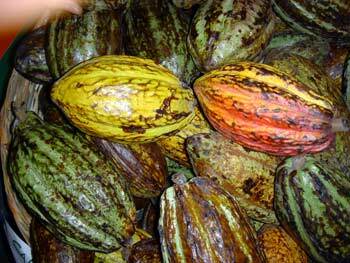 That photo of the cocoa pods–amazing. Your little chocolate cakes–oh my. But shame on you–didn’t anybody tell you they’re not called prunes anymore? They’re now known as ‘dried plums’ if you please. . . (Just trying to save you from attack by the Prune,um, Dried Plum Board.) Have fun in Italy! 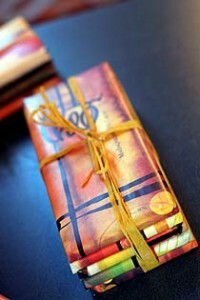 oh, the chocolate, tempt me any day… and do go to italy, it’s wonderful! How come you aren’t fat? The rest of us who play with our food are or are getting there. Holy Crap that was a thorough post! Very few wines fit with chocolate. I would say Champagne or Sauterne (very sweet wine). But the best remains water. Oh, yum yum yum. I can’t wait to try these – using rum and little ramekins. I’ve been obsessed with your recipes since making your Fresh Ginger Cake several years ago, so I’m excited to have something new to try out! Mmm… I made these cakes tonight using cherry-flavored prunes and framboise. I baked in ramekins for 12″ and they came out great. Even my husband, who doesn’t like alcohol in food at all, loved it. The hard part is saving the others for tomorrow so we can taste how the flavor develops. Oooh, these do improve with age. I only baked 12 minutes (see above), and it had a light, creamy mousse texture and blended flavor.